To update from my last post: I walked down to the local GP office and made a doctor appointment. The receptionist didn’t bite, didn’t ask why I needed a doctor, and didn’t flinch when I asked for the same doctor I saw last time I was there. Anxieties have temporarily subsided and I’m filled with comfort food. If it sounds like I’m doing better, I am. The first scary step has been taken and I’ve gone from a sobbing low earlier today to a much brighter and nearly happy state. I’d call it stability. Stable is good. Hot damn! that was a good sammich! Almost medicinal. Previous PostI’m tryingNext PostTalking cats. Yes, really. Mashed potatoes on a sammich??? Potatoe chips I can see. Now you have me intrigued. I’ll have to give it a whirl sometime. Much simpler than today’s sammich, but decadent in a different way. Batter and deep fry the fishfinger sammich! I just might sit here and fantasise about that uber sammich for a moment though. or here in the north, most fish and chip shops sell what they call “patties” – mashed potato, battered and deep fried – some have sage in them, put I prefer them without, and some have pieces of cooked fish. today, I cooked some comfort food (Rob’s fave dish actually). I made chicken fried steak, mashed potatoes, white gravy, and sweetcorn. I am sooo excited cause Tescos are now carrying Miracle Whip (today it was half off so Rob got me 4 jars!). Anyone for some Potato or Tuna Salad? Devilled eggs? You really need to substitute the mashed potato for Salad Cream. 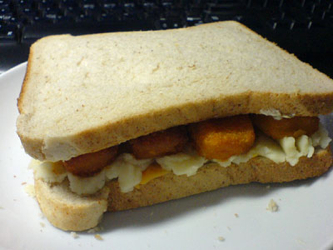 Fish Fingers, cheese and Salad cream sandwiches kept me going for years!